For many, the end of the year means time off and relaxation. The end of 2014 brought extra stress for our medical group as our Meaningful Use coordinator took an unexpected medical leave three days before the end of our reporting period. After having previous employees leave us in the lurch, we’ve learned to assume that someone could win the lottery and not come into work the next day. We’ve tried hard to make sure that all of our key roles have a backup person designated to step in. We also have strong policies and procedures regarding documentation to ensure that if we have to replace someone, the potential negatives are minimized. This was a good test of our system. So far, things seem to be working well with just some minor glitches. Our leadership group had already approved the plans for creating the attestation documentation for Eligible Providers. Those parts of it that could be done in advance were already largely complete. Fortunately, our vendor provided extremely detailed Meaningful Use training with almost ridiculously specific instructions for how to prepare documentation in case of an audit. Although we made fun of it at the time, we’re very grateful for it now because it has allowed us to quickly determine what documentation we have and what we still need for each physician. Although some people instinctively react to the billions of dollars spent on Meaningful Use and even more specifically to the $44K per Eligible Provider figure as some kind of a windfall for physicians, it doesn’t even begin to cover the amount of money needed to actually install, maintain, and optimize the software needed to qualify. It doesn’t pay for the lost productivity while we check boxes that don’t assist us clinically, either. For our group of several hundred providers, it also requires multiple full-time staff members to train, report, retrain, track, analyze, and educate so that we don’t miss our goals. We’ve definitely been hurt by the fact that Meaningful Use is all or none. Last year, we had a couple of providers who were really close, but failed on one or two measures, which results in an unsuccessful attestation. We redoubled our efforts around those providers and it looks like they’re going to be successful this year. Still, my office is now full of hundreds of individual physician binders, ready to receive the rest of the attestation documentation as it becomes available. I wound up as the lucky repository for it since my office is a converted conference room and I’m in it only rarely. I didn’t think much of it initially, but now that I sit here looking at all the work in progress, I think about how many hundreds of hours of staff and physician time have been taken up trying to chase the MU money and avoid future penalties. I can’t help but think that it hasn’t been worth it. As employed physicians, most of my colleagues don’t have a choice whether to participate or not. As we continue to acquire practices, it has become more complicated. Some may have attested previously under another employment agreement or as individuals and may not have the data we need. Others are unsure whether they’ve attested or not. For those who have been employed at the same place since 2011 when this all started, though, it has been a little less complex. Still, those "complicated" binders take up an entire folding table in my office. At least as independent physicians they received the MU payments directly. However, as employees, the payments are shared between the physicians and the organization. Our group is one of the only employed groups in the area that actually shares the incentive payments between the employer and the physician. Our competitors absorb the payments as a cost of doing business. It’s all part of the complexity of physician compensation and reimbursement. Some health systems "charge" employed physicians for EHR costs and maintenance, while others don’t. Some distribute payments based on overall group performance (so providers might get compensated for MU payments although they would be filtered into the general fund first). Still others have arcane and specific accounting systems that charge or reward physicians on a line item basis. As employees, they could determine whether MU payments were a boost or a bust, but they still wouldn’t be able to do much about it. The one entity for which MU was definitely not a boost (at least not at my organization) was the environment. We’re printing reams of paper for our attestation documentation binders (aka audit defense). Although we have soft copies as well, providers will be required to maintain the documentation at their primary practice locations and we will also keep a copy at the home office. 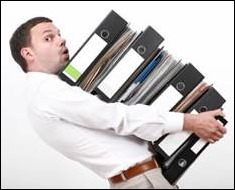 The amount of paper moving into my office on a daily basis as more reports are delivered and more screenshots are prepared is truly staggering. At least someone had the foresight to buy printer paper that was already binder drilled so we don’t wind up with repetitive motion injuries from the three-hole punch. I don’t think any of us expected to be in this position a decade ago, where we would be using twice the paper we eliminated with EHR just to keep up with government mandates. Although we’ve streamlined care through interoperability and data sharing (at least in my surrounding community), we’ve created more bureaucracy than we’ve eliminated. Still, it’s a new year and I remain hopeful. Hopeful that MU Stage 3 will not bring more onerous requirements and that our vendors will have some breathing room to return to coding features we actually want and need rather than what government entities think we want and need. I’m hopeful that patients will continue to take advantage of all the patient engagement opportunities and that those who are not yet doing so begin to manage their health and have preventive services performed as appropriate. I’m less hopeful that physician and staff burnout will decrease, but I’m trying to remain optimistic and instead just hope that it won’t increase. What are your hopes for the New Year? Email me.